Does DC take a step in the right direction with this band of misfits? And the man in the back said ‘everyone attack’ and it turned into a ballroom blitz! Viola Davis IS Amanda Waller, Confirmed! 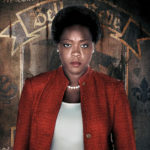 Amanda Waller is in the house! How to Get Away With…A Suicide Squad!